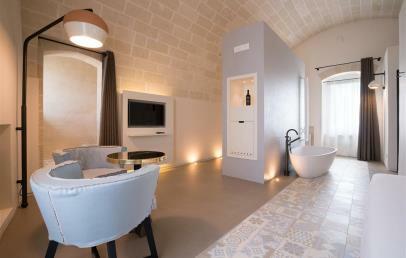 recommend this charming Wine Resort to wine buffs and all those in search of the genuine Puglia wine and food experience. Situated in the countryside of Crispiano, on a hill 210 m above sea level, the Masseria Amastuola is set at the heart of a 170 hectare estate, with ancient olive trees, vineyards and dry-stone walls. 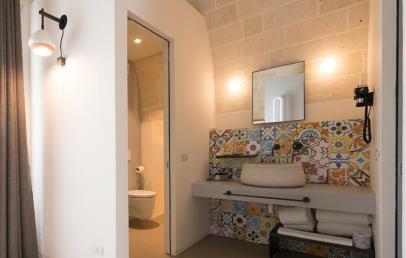 The siting of the Hotel means that guests are within easy reach of the best-known attractions of Puglia and Basilicata: 20 minutes from Martina Franca, 35 from Alberobello, 45 from Matera and 50 from Ostuni. A fascinating country house dating back to the 1400s, Amastuola today hosts a stylish wine resort, set in the beautiful vineyard-garden designed by landscaper Caruncho. The farmhouse is built round a large sunny internal courtyard and looks out with its wide terraces over the Ionian Sea and the vineyard. Wine culture is a distinctive feature of the Masseria Amastuola, which has a welcoming tasting hall, barrel vaults, a bookshop and a traditional restaurant. 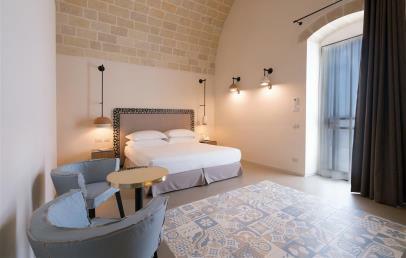 Set on the first floor of the main building and on the ground floor, in the area of the old sheep pens, the 18 rooms of the Masseria have minimalist décor, with white stone walls and stylish designer furniture. 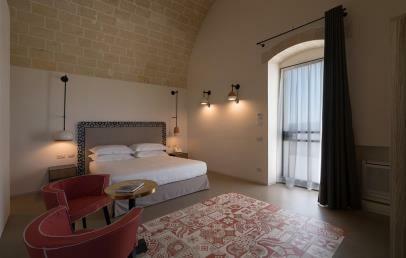 The rooms set in the historic building all have vaulted ceilings and can be accessed from the great courtyard of the masseria. Passing through the garden-courtyard, for exclusive use, guests will access the new rooms created in the area of the former sheep pens, all with independent entrance. The rooms have an area ranging from 30 to 51 m2 and have all mod cons: Wi-Fi, phone, small safe, heating/air conditioning, SAT TV and mini-bar. 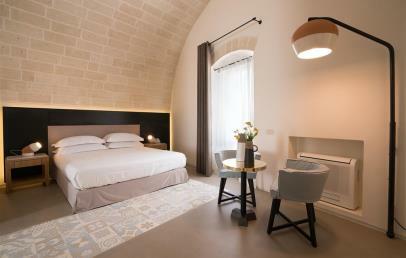 Originally designed to welcome groups visiting the vineyard, these rooms offer all types of guests the authentic experience of Puglia hospitality. Cost of the room includes breakfast and Wi-Fi connection, available both in the rooms and in common areas. 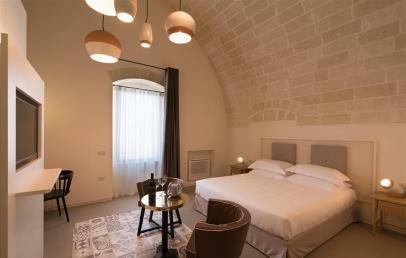 The many activities on offer allow guests to transform a pleasurable vacation into a full-immersion Puglia experience: guided visits to the vineyard and winery, wine tasting and offers of the best local products, cooking courses, bicycle tours along the estate pathways, horse riding or rides in a horse-drawn carriage, angling. Small pets are welcome with prior booking and at management’s discretion. Late check-out is free of charge but is subject to availability. 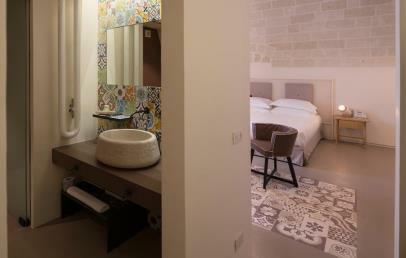 The Deluxe rooms keep the original country coupled with all mod cons. 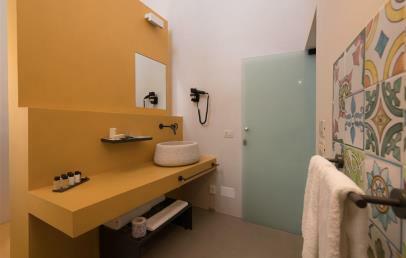 Apart from a stylish ensuite, designer furniture and accessories, these rooms offer exceptional comfort. 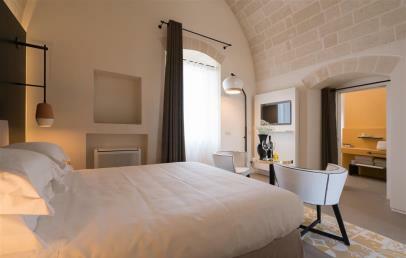 Large and sunny, the Exclusive rooms have a full range of comforts and are furnished in Amastuola style: a balanced blend of the farmhouse tradition of Puglia and modern designer furniture. 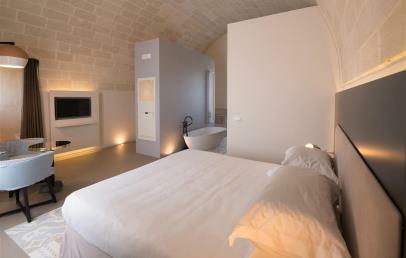 Some of the Exclusive rooms of Amastuola have an extra window, making the accommodations more sunny and with a panoramic view embracing the courtyard, the garden-vineyard and the surrounding countryside. 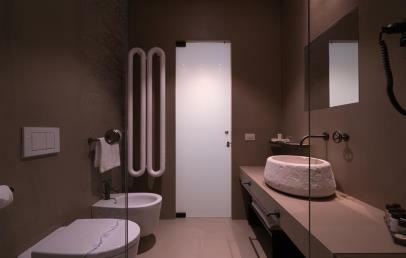 The Suite is the leading light of Amastuola hospitality, a room equipped with a full range of comforts and a tub ideal for unforgettable moments of relaxation. 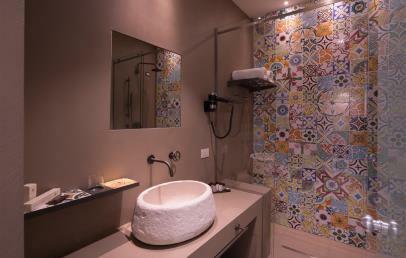 The Amastuola suite is very large, comfortable and offers the exclusive advantage of entry to a private solarium. Book at least 30 days in advance and get a 10% reduction on your stay.